HOME OF THE GREEN VACUUM CUPS! Better Vacuum Cups, Inc. manufactures top notch vacuum cups for all CNC Flat Table Routers. We also manufacture vacuum cups for a variety of other concepts such as bench-top systems, point to point routers, as well as the stone industry. 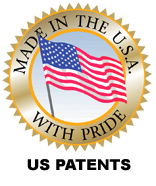 We provide proven quality products that many major machinery manufactures endorse. Our name fits the quality of our products, they truly are Better Vacuum Cups! Better Vacuum Cups, Inc. provides top-notch Vacuum cups for CNC Routers, Flat Table Routers, and CNC Stone Machines backed by great customer support - a combination that can't be beat! Through commitment, experience, and expertise Better Vacuum Cups Inc. has established a business relationship with their customers that lasts a lifetime! BVC cups have 30% better holding power and are a fraction of the cost over OEM, this is the cup for your machine. BVC rubber tops are also sectional, 2” parts are no problem on our 6” cup. Just use gasket material. BVC rubber tops are also thicker giving you over 10mm before you route into the plastic. No more clogged port or dust in your vacuum system. BVC has a simple ball valve to keep the dust out. Routed into your rubber tops? No problem. BVC rubber tops with incorporated groove can accept foam gasket to make a new seal. Routed into the plastic? No problem. BVC modular plastic design can be made into a half or quarter cup. Better Vacuum Cups, Inc. has brought their successful line of vacuum cups to stone and glass fabricators. BVC vacuum cups for stone are lighter in weight than other cups. They take less effort to place, less money to buy, and they hold your slabs tighter. Spindle collided with your cup? No problem when using BVC SS series cups. Just install the foam gasket in seconds, after running into the rubber lid. Better Vacuum Cups Inc. was founded by Mike McClaran in January 2005 and is located in Chino Hills, California. Mike McClaran has been in the CNC Woodworking industry for the past 26+ years. He is widely known in the industry and dates back to his father and grandfather being the first CR Onsrud dealer on the West Coast. Mike opened his own company servicing Biesse machinery in January 2005. Prior to his opening he was employed by Biesse Group America as a Senior Technician for 9+ years. Other former employers include HolzHer, Stiles and REAlbright. Better Vacuum Cups Inc. maintain rich strategic partnerships with machinery manufacturer across a spectrum of disciplines and specialties. These relationships enable us to enhance our product offerings and provide outstanding service and solutions for your CNC equipment.